Before beginning this novel I checked out a few reviews on Goodreads. I wanted to be surprised but I also wanted to get a general consensus and I believe the consensus is that your enjoyment of this novel will be based on what “team” you are on. Which is too bad because I think there was more going on here then just who Juliette was going to pick. Ignite Me was compulsively readable. Very, very, little happened plot wise and I was still enamored by the characters making plans, training, or whatever they felt like doing between dialogue. Despite being a dystopian this novel, and the entire series, are character driven. One of my qualms with this finale was that the writing, which I found so lovely in the first book, basically disappeared. Juliette wasn’t striking out text or making long-winded analogies. She really has her stuff together in this novel and the story reads that way. Juliette isn’t lost in her own head so I can see the need to change the way the story is written but I still missed the pretty prose. One of my favorite aspects of this story was how much Warner grew as a character. We get to see his justifications for the choices he has made throughout the series and I think this novel made a lot of sense when read in conjunction with the two novellas Mafi wrote Destroy Me and Fracture Me. While neither novella blew me away I think they did a good job foreshadowing the outcome of Ignite Me. On the other hand I couldn’t stand Adam. He went from being kind of ho-hum to something completely out of character. Adam genuinely surprised me but not in a good way. I guess I expected better of him, and it’s sad when characters let you down. 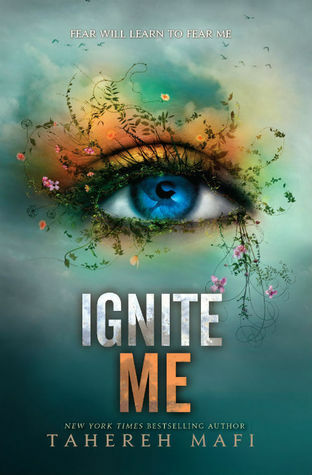 Overall, Ignite Me was a solid finish to the series. I finished the novel very quickly because I just had to know what was happening next and even though nothing was happening I was still on the edge of my seat which I think speaks to the quality of Mafi’s writing. I can’t wait to see what she has in store for us next! Aww, it's nice that this series rounded off nicely! I'm such a procrastinator, and haven't read any of it yet -hides- Too bad to hear the writing became more basic though..I agree it's so nice when the diction is elegant, especially for YA books. The character development sounds really amazing, however! Lovely review, Emily! I am glad you were able to enjoy the lasts of this series. I hope the change in writing style wasn't too disruptive when you reading this! I also think that it just being about teams is pretty saddening. Character driven novels are my kind of thing, but I would like a book to be more meaningful than that. I haven't tried this trilogy yet, but it looks promising!